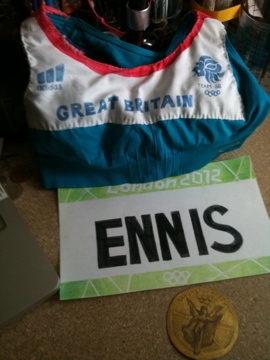 This is Jessica Ennis. 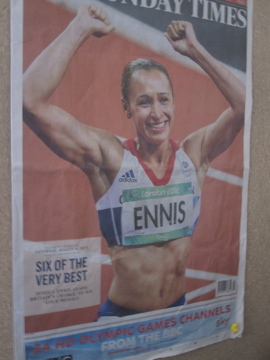 She’s a gold medal winning British Heptathlon athlete and the reason I broke my foot. She is incredibly fit. I wanted to be her, basically, and running an hour a day every day for three weeks straight is apparently *not* the way to achieve that goal. So when Halloween came around, and I had to think up something I could be that would work with the giant futuristic cast on my foot, it was a struggle to think up an idea. Robo cop? One of the Transformers? Neil Armstrong? A Skier? 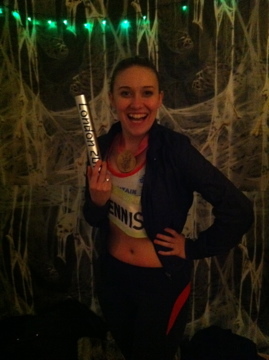 Nothing that really inspired me until I realized that considering how tough it was to work out enough to be Jessica Ennis, dressing up as her for a day would be a much easier way to realize my dreams. 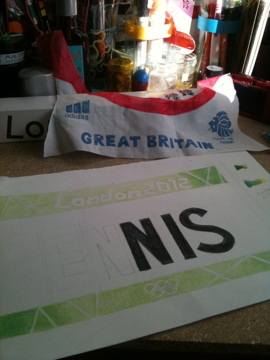 I took a sports bra, and some left over fabric from my day job (the Lush Tailor Made window) and traced out a pattern for the TEAM GB top. 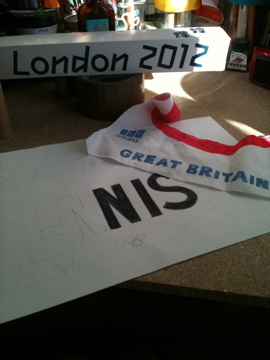 Since my printer isn’t working and I’m not going near my office until 2013, I then hand drew all the details for the top. 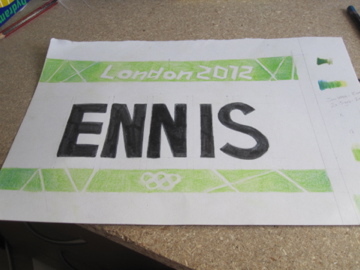 That lion logo ain’t an easy thing to freehand. 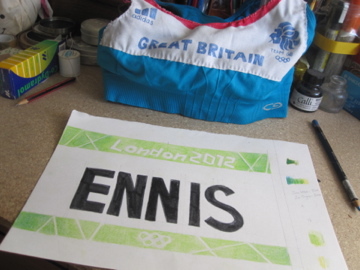 I also drew her running bib, and by bizarre coincidence got sent an official London 2012 relay baton in the post as a thank you for volunteering for London 2012. Thanks Boris! 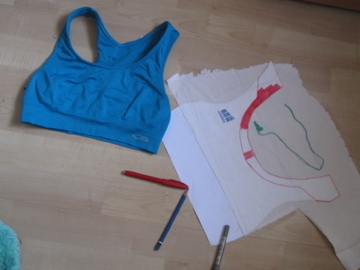 Sewed the fabric to the existing sports bra, and finishing off her paper running bib. 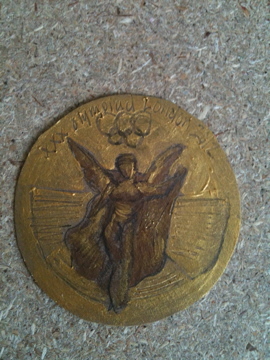 A gold medal made of acrylic paint and pencil on cardboard. It is fairly accurate, but really who would know that! There is a fine line between being accurate, and being a bit racist. This entry was posted in Artwork and tagged Costume, Craft, Dressing Up. Bookmark the permalink.